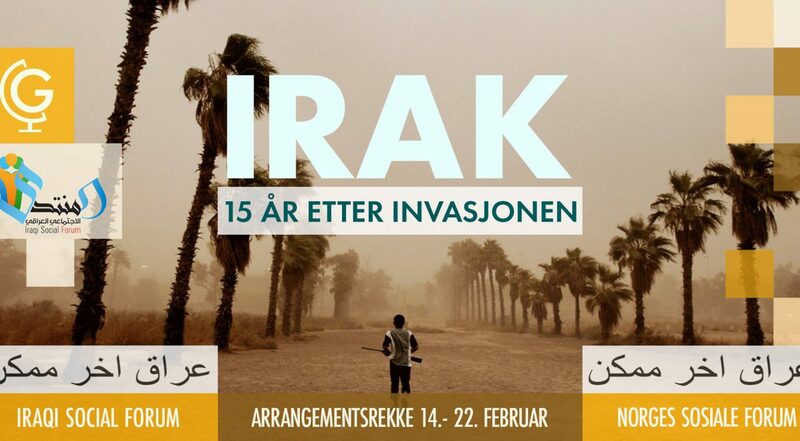 A delegation from Karibu-partner the Iraqi Social Forum (ISF) will visit Oslo in February for a series of events to commemorate the 15 Year Anniversary of the Iraq War. Below you will fine more information about the events taking place across the city. The Norwegian Social Forum (NSF) and the Iraqi Social Forum (ISF) invite you to an event series in Oslo (14th, 29th-22nd. February) about the Iraq war and protests against it, peace-building, the fight for resources, and equality and feminism in Iraq. 70,000 people demonstrated in Oslo’s streets against the Iraq war. Where do we stand 15 years later? Why was Iraq invaded and what was wrong? What created that enormous commitment? How has the collapse in Iraq affected the rest of the region and the world? Activists from the Iraqi grassroots movement tell about the processes and challenges in the reconstruction of the Iraqi society. Oil and water are limited and controversial resources in Iraq. Who has access to the resources, and who should the wealth from the resources fall? Women’s struggle and women’s liberation are a key part of community building and lasting peace in Iraq. Central people from Iraqi and Norwegian women’s movements discuss women’s struggle and peace processes in the Middle East. We are in Northern Iraq, in the area of ​​”Triangle of Death”. We met the nurse and four-year-old Nori Sharif, thinking the American forces are withdrawing from the country. But the hope of peace and reconstruction snuffs to a new and worse war – one that breaks all taboos and where you can not divorce friend from enemy. There are no safe hiding places. How are Nori and the family doing? In collaboration with the Babel film club.